It appears that a plethora of users in Down Under have fallen victims to a pretty vast ransomware attack, which affects Apple iPhones, iPads, and Macs alike. A wide array of these got remotely locked up by ill-doers, who exploited the Find My iPhone feature and rendered the affected devices literally unusable. On top of it all, the crackers behind the attack sent multiple ransom notes that demanded the affected users to pay between 50 and 100 Australian dollars to a certain PayPal account in order to regain control of their beloved gadgets. 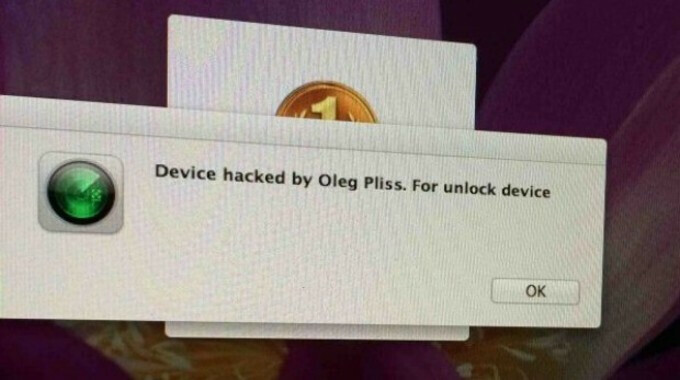 Most of the ransom notes state that Oleg Pliss was the cracker behind the malicious attack. It is also important to say that the affected devices got locked up by no malicious app or program. The culprits for the unfortunate event are nothing else but compromised Apple IDs, the passwords for which could have been easily stolen "from recent data breaches". If we also take into consideration that most people tend to use one and the same password for years, it comes to no surprise that the wrongdoers succeeded in locking up a big number of Apple devices. "It’s quite possible this is occurring by exploiting password reuse. Regardless of how difficult someone believes a password is to guess, if it's been compromised in another service and exposed in an unencrypted fashion, then it puts every other service where it has been reused at risk," claimed Troy Hunt, an IT security expert. Fortunately, Apple IDs with a two-step authentication have not been affected by the scam. In addition, those unlucky owners of Apple devices with passcodes easily succeeded in reclaiming control of their gadgets. Still, it seems that some of the affected users fell into the trap and sent money to the email that Oleg Pliss listed in the ransom notes. Interestingly, a PayPal representative revealed that there was no PayPal account linked to the email in question. It was also said that any money that had been forwarded to the email will be refunded in a timely fashion. Meanwhile, local Australian carriers advised the affected users to contact Apple so that they can regain access of their accounts as soon as possible. However, Cupertino has not issued an official statement on the matter yet. What windows are you referring? This isn't an Apple vs The World issue. It's a user error problem. "One password to rule them all" is a lazy -- and risky -- practice too many of us follow. The Ars write up on this says the popular theory right now is DNS poisoning. Because of that, even entering "apple.com" manually would still take you to a hijacked page to capture data. If true, then the reason the TFA folks didn't get affected was that they're not set up to take advantage of that small window when the codes are still valid. WoW players had to deal with this a long time ago. The fraudsters were VERY well set up and automated for those hacks to work. And how many more would have ponied up with cash for "S. Jobs"
This isn't so much of an issue with iOS, it's an issue with people being careless with their passwords. Odds are they probably had their passwords compromised when logging into various web pages using the many exploits in Internet Explorer. Microsoft's software is probably the least secure of any of the major software developers. This has got to be one of the biggest bait articles I've seen in awhile. What bait? Its a true story! The galaxy s5 camera bug article can be pointed as Bait due to the exaggeration, but this.... No. But this only affects you if you use Spotify. I don't use Spotify, ergo, it doesn't affect me, or any other user who doesn't use Spotify. Wow apple is always being hacked why???? Knowing someone else's password is a "hack" now. Yes, it's not a hack when you use a common password or the same password throughout. No worries. The usual fandroids have already started to blame Apple for this...LOL.